Many Norse warriors attempted to emulate the qualities of ferocious beasts, either by berserking in combat or by adopting their images on their person. This Round Dragon Knot Viking Shield is one such attempt to harness the power of the legendary dragon. The round shield was, by far, the most common style of shield favored by the Vikings, and for good reason. Not only was it an easy shield to craft and repair, but it was also a hardy and easy shield to wield, too! This particular shield is crafted entirely from hardwood and features a metal ring around the edges, for increased strength and durability. 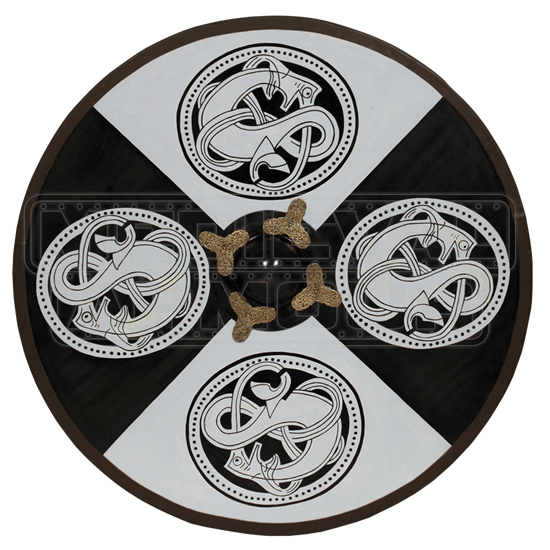 The shield is segmented into four sections of alternating white and black, which each section being adorned with an intricate Norse dragon knot (black on the white sections, and white on the black sections). The center of the shield is adorned with a metal boss, which is accented by four Y-shaped metal plates that possess ornately etched details. The shield is fully functional, and is perfect for use in mock-battles and reenactments, to help recreate the authentic and ideal look of a Viking warrior. It has an approximate diameter of about 36 inches. 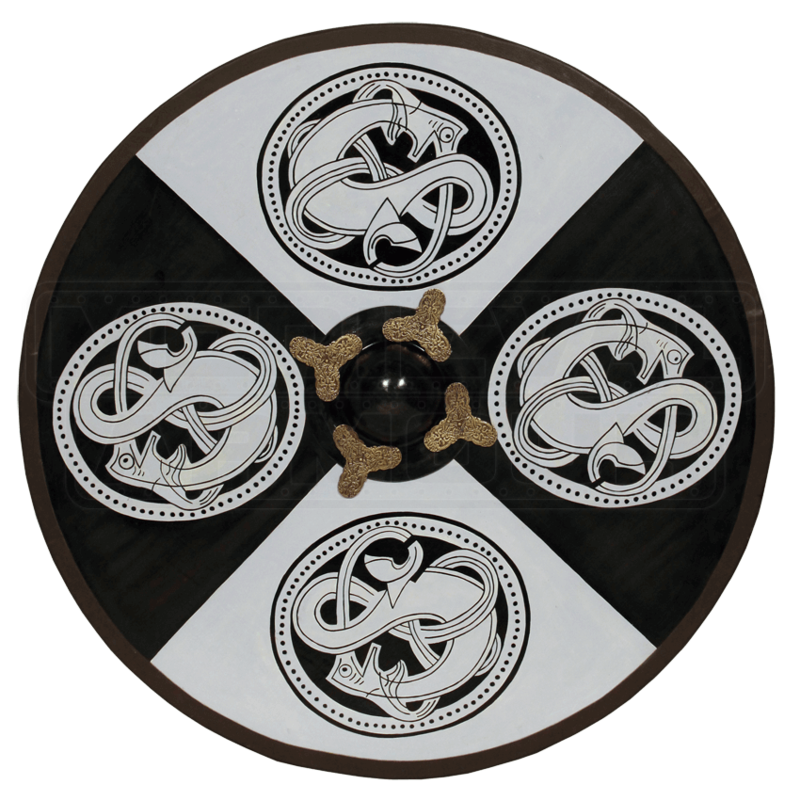 Possessed of rich, fine detail, this Round Dragon Knot Viking Shield is more than just a fine shield. It is also a great display piece, one that you can take off the wall to serve you in battle, and then hang right back up, to impress all who might enter your mead-hall or longhouse. This shield is beautifully made, and very good quality. It is large and heavy, so be aware of that before you buy it. It weighs maybe 15 pounds, but if you want a large shield this one is worth the money. It's also a great display piece.